Homespun Devotions: Does Your Heart Still Burn? Does Your Heart Still Burn? and while He opened to us the scriptures?" If ever there is a time in my spiritual experience that I begin to feel dry or a bit distanced from our Lord, I need only to turn to this passage to find my way back. It touches my soul, deeply moves my spirit, and compellingly beckons me to a deeper, closer walk with Christ. We have had such a busy summer. I mean really pray...the kind of praying I go to such great lengths to defend making time for. The kind of prayer time that I crave and miss desperately when it doesn't happen. never missing a word, but the "necessarily-Martha" part of me has, of late, seldom allowed for it. It has been a real challenge to maintain the level of communion with God that I am used to and that I long for, during a time of so many surrounding demands and needs that sometimes only I could fill. All of us have the same struggle, do we not? I saw that we were on the 24th chapter of Luke in our regular reading. Oh, how my heart filled with joy! As we read, I just began to weep...and I wept...and I wept some more. began to pour down and flood my thirsty, utterly-parched soul. I could not stop crying as we came to verses 13-32. Oh, the power in this story! If you haven't read it lately, I highly recommend it. sad, dejected, disappointed beyond words. Just picture the way your heart would begin to burn if the living Word Himself began walking beside you and verbally opening up the written Word to you, expounding on the very Scriptures that prophesied so accurately of Him and all that would happen in His life. leaving you alone with your walking companion. As you see Him beginning to walk away, you realize that something remarkably precious is about to come to an end. Would you not beg Him to stay? Just like Cleopas and his friend did? Somehow, they were blinded to the fact that this was really Jesus. themselves to even open their minds to the possibility that He could truly have risen from the dead. For whatever reason, they did not recognize Him. to come inside, and take a meal. There was something about Him. Something so compelling...so constraining....so all-consuming. As He broke bread, they knew. He vanished out of their sight. That deep stirring that is ignited in the pit of one's soul after coming into contact with Jesus Christ! There is nothing in this world that will move the hungry-for-God heart to such entire passion for His holiness. One cannot walk away from such a juncture, without being forever and profoundly changed. "Now when they saw the boldness of Peter and John, and perceived that they were unlearned and ignorant men, they marvelled; and they took knowledge of them, that they had been with Jesus." The ones who stood around them...the listeners, the observers, the on-lookers.. Nothing else could affect a person so. An encounter...time spent...with Jesus Christ was evident in everything Peter and John did and said. and that burning had completely consumed them and transformed their very lives. He had drawn near...to us, too! He had sensed our hunger. And, He had come very close. "Can we sing?" I asked. We sometimes do that, during our family devotions, but not always. Today, I could not keep from it. The burning was so rekindled. The fire in my soul so strong! My voice broke several times, as I could hardly sing through flowing tears. We take turns praying our opening and closing prayers to begin and end our Bible study time. Today, it was Kevin's turn to pray the closing prayer. "Mama, you seem so blessed. Do you want to be the one to pray? "No, Zach, of course I don't mind." Kevin always understands, God bless him. We all bowed our heads. My knees hit the floor. as revival fire burned bright in my soul. He is a faithful God, and I have never loved Him more. How is it with you, dear friend? Do you miss His presence? or has something dampened the fire? Are you, like me, finding it difficult to steal away and pray? Are the demands of life of such degree that your spirit is left dry, neglected, and longing for Him? He longs to meet with you. He misses His time with you, too. and penetrate the distance with His love. May you know, with a surety, that He is holding you, even when you feel that He is a million miles away. Sometimes, He just wants us to "feel after Him". "That they should seek the Lord, if haply they might feel after Him, and find Him, though He be not far from every one of us..."
Seasons of spiritual dryness are followed by blessed times of refreshing. Soon, your moment of rekindling will come. To read a throwback, long-ago-written post about the road to Emmaus and my precious Mom, click HERE. missing them more than ever. In honor of my dear parents, I am sharing some songs by two of Mom and Dad's favorite singers ever. I will never hear the Louvin Brothers' precious songs without thinking of dear Mom and Dad. and hearing them now takes me way back to another place and time. I hope you enjoy them as much as we have through the years. Dear friend! How I appreciated your precious, kind words today! I so appreciate you sharing your heart with us here, and I trust Jesus that you are feeling better. I think of you often and am praying for you. You are very dear and precious, too. Sending you much love, many hugs, and gratitude today. You always encourage and uplift my spirit each time you come by! God bless you! Awesome… How true! A family that prays together stays together. To having His spirit overflowing our physical bodies is a sure sign He's inside of us. I do an in depth Bible study weekly. I do it for a study with a buddy of mine, but mostly I do it for the sole purpose of that verse in James that you quoted, "Draw nigh unto Me and I will draw nigh unto you". It literally saves me spiritually then physically. I'll be doing some praying with my baby this afternoon… she's going to be spending her first night in her new life; college. Oh, Floyd! I know you will miss her so much! Bless your heart! I am praying for you, brother, and trust God to fill the void with an overflow of His presence. So thankful for praying fathers like you who will take the time and intercede with and for their precious children. I am so thankful you and your buddy can study God's Word together, too. Sending much gratitude to you for your kind words and many prayers up to the Father on your behalf. Those two disciples had been with Jesus for a number of years, and they had witnessed His preaching and His many miracles. Yet, on the way to Emmaus they did not recognise Him. Let's consider their state of mind at the time. Their leader, their Lord, had been crucified and died a horrible death. There were rumours that He rose from the dead. But then, what were they to believe? What would happen to them next? With their leader gone! What of the future? Their minds were totally confused with self. What is to happen to THEM and not what has actually happened to Jesus. That's why they could not SEE Him or recognise Him. It's the same with us today. Whenever we focus our attention on our selves, and away from Jesus, we fail to see Him walking beside us and ready to help. Oh, my...your words, "their minds were totally confused with self" really stood out to me this morning. How often we do the same thing! You are right, He is always walking alongside us to help us and be there for us, but we so often are so self-consumed, we don't even recognize Him. Such true thoughts! Thank you ever so much for your input and for sharing what God laid upon your heart. You are such a blessing! Hello dear Cheryl! I love that verse in James too. It is a promise. 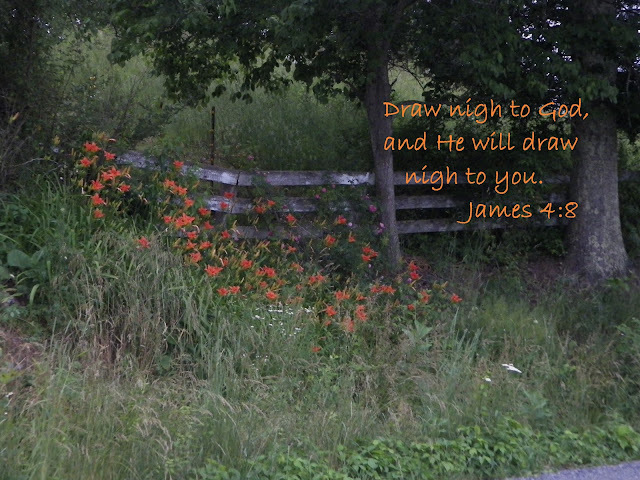 He will draw near when you choose to draw near to Him. I love that thought! I also thought Jesus prevented the two disciples from seeing Him as Jesus. The NLT actually says that He did close their eyes. It was as if He didn't want them to know as He discussed the scriptures and prophecies with them to make it all soak in and when He opened their eyes, it all made sense. It was like He was helping them make the connection. I do always appreciate that story though. Dear Kristina! It is always such a dear blessing to know that you have stopped by. Your words are always such an uplift and encouragement to me! Thank you for sharing your thoughts here...they always edify and support the burden upon my heart. God bless you abundantly, sweet friend! Thank you for your faithful prayers. Thank you Cheryl for that beautiful post. I need to come back and re read it several times. Thank you for your kind encouragement, sweet friend. I am so grateful for your presence in my life. God bless you today! Yes! That He draws near to us and we draw near to Him is such an important fact- and such an awesome picture of life with the Lord. Begging Him to stay- I hear you. Also on not having time to be Mary-like because life is asking for Martha-like- so grateful He is near then too! Yes, praise His name, He loved Martha as much as He loved Mary. He understands our obligations and is so faithful to strengthen us for each new day and challenge. Thank you ever so much for your sweet visit, Bethany! There's a Christian song your post reminds me of I think it's by Third Day called Love Song, and it talks about "Just to be with You". I can't get enough of this song! I like this story too because even though the disciples of Christ were sad and withdrawn, Jesus was right there with them! I pray that He open my eyes in those times so I don't miss it when I'm in one of those places! God bless you, Cheryl, and thank you for this excellent message! OH, I will have to check out that song...I don't remember having heard that one. YES, I trust He will open my eyes to see Him, too! It is such a dear blessing to me each time you stop by here. Love and appreciate you, sweet friend! I love the music, reminds me of songs from long ago in the little country churches. Several ladies and I meet on Friday night and pray and that is good. Sometimes one of share something God is dealing with us about but we usually only talk surface about it. It's when I am alone at night when sleep won't come that those deep issue come pouring our of me. It's then I am refresh. I love corporate prayer but I crave alone prayer with Him. My life shows it when I don't have those times and it's certainly not Him that is the hindrance. It is a battle to have those time, more of a battle then meeting with my christian friends for prayer. Lovely post sister, great reminder that the enemy of our soul hates our prayers. Yes, my friend, it reminds me of those dear, old songs, too. I miss that, and hearing their songs is like a reconnecting bridge. Thank you so much for sharing your edifying thoughts with us here. It is always a great encouragement when you come by! Blessings to you, sweet sister. Beautiful verses. Thank you for sharing Cheryl! We have The Family Who Prays on one of our favorite records, so I've listened to it many times! I just was playing How Great Thou Art on the piano today, but I think the last time a sang it was at a funeral I recently was at...and I couldn't make it through the song without crying either--the lady who died had been married to her husband for 67 years, and they were just the sweetest couple. Good to know "their circle unbroken in heaven shall stand." Oh, I LOVE that dear, old song, too! So happy to know that you love it, too! That is such a precious story about the dear couple who were married 67 years! I am sure it was very moving to sing that dear song at the funeral. I know God used you in a special way to bring His touch to the situation. Thank you so much for your sweet visit...you always, always brighten my day! That's all He needs, a flickering. And though I sometimes feel like that's all I have left, a mere flicker of light, my heart still burns within me. I also love the story of the two men on the road to Emmaus. They may not have "known" who they were walking with, but their spirits did. May God fan the flame inside of me, for I long for Him more than ever. Dear, Sweet Cheryl, You have such a gift for writing. I hang onto every word, always feeling refreshed and encouraged, allowing your insights, wisdom and most especially your humility to penetrate my heart. I remember a painting hanging in my Pastor's wall, it was Jesus walking with two people among tall Cypress trees. I believe it was depicting the very story you shared today. That painting always had such an impact on me, and like you, especially the phrase, "Were our hearts not burning within us." I have been in a long season of necessary Martha activities, but the Lord has been meeting me in profound ways in the time I have been spending which at this time, seems to be in the evening before I go to bed. There seems to be something about studying the Word before bedtime that I feel I must be processing throughout the night while I sleep because I am noticing a marked improvement in my attitudes throughout the next day. Dear, precious friend! Thank you ever so much for your precious encouragement and kind words. They truly mean the world to me. I always love and enjoy the thoughts you share...both here and at your dear blog. You are a great blessing to me, and I trust God to reward and bless you abundantly! I don't suppose there is a greater compliment that we could ever receive then to say, after being in our presence, that it was evident that we had been with Jesus. I love the joy you capture in savoring your time with Him and both the comfort He provided and the flame He lit. Keep shining, friend. Oh, how true! That is truly the best compliment we could ever receive, without a doubt. How I long for Him and to be like Him! Thank you for your dear visit and support and encouragement, dear Tiffany. I trust Jesus to pay you a special visit today and lift your burdens. Praying for you! Tears reading this. Thank you so much for linking up with #TellHisStory...so very glad to be your neighbor today. This is so beautiful and thank you for the gathering of Scriptures and sharing of your parents. I've been thinking of my Mum a lot lately too and I've been struggling to get away for quiet time alone...something I just cannot do without. We have two more weeks of the holidays left...then back to school. I am SO happy we were neighbor, too, dear Anna! Thank you so very much for sharing your precious encouragement here. I am so sorry you are missing your Mum...my heart goes out to you so much. I hope you are able to find your alone with Jesus time...enjoy every moment! Sending you love and blessings! Wow!!! What fire! The incredible love of God moving your heart to tears, what more can we ask when facing such dry days of thirst! I so relate to not being able to pray deeply, how life takes us away from Jesus, and how I long! You give me hope today, I have wanted to feel the fire of His love and you remind me when we seek we find..just beautiful, and I love the songs..! What a blessing! Visiting from next door at Testimony Tuesday! How I praise God for your visit, Kathy! It has lifted my spirits and blessed me more than I can say! God bless you in a big way. It is SO wonderful to meet you! Yes there were two on that road with Jesus, but it is true even in a crowd small or large, it can be JUST Jesus and me walking together. I loved this post and your tender spirit to be both Mary and Martha. Thank you for sharing with us here at Tell me a Story. How great thou art is one of my favorite hymns. I'm reading the Mary/Martha bible study right now and it's a good lesson to me to stop the busyness of being a Martha and just breathe into being Mary. Have a blessed day and thank you for sharing. I love that song, too...it seems to just burst forth when I feel like I don't know how to put my praise into words. Thank you for stopping by, Terri..your visit was a blessing to me! What wonderful verses you shared - Thank you! I too, love that story of walking with Jesus on the road to Emmaus. Thanks so much for sharing the insights that you have received from it. I loved hearing about your family devotion time and the blessings that you shared together. Thank you so much, Abbi! It is always such a dear blessing when you stop by! I have changed email addresses and am not receiving your email, so I need to hop over to your blog to sign up with our new address. So happy to see you today! And, I am so blessed to have been honored with yours, my friend! Thank you ever so much for your sweet visit today. It was such a dear blessing! Sending you much love and many hugs! Oh, praise the Lord, JES! I am so thankful you were blessed here. So very thankful for your visit and kind words, too. God bless you abundantly!